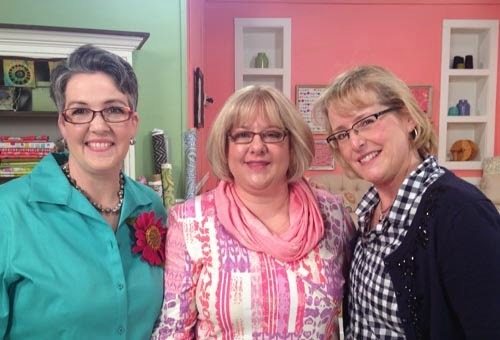 Last week, I was in Cleveland, Ohio, shooting Series 1400 of “Quilting Arts TV.” I’ve been a guest four other times, but this was my first time as host. I wasn’t very nervous, just excited. 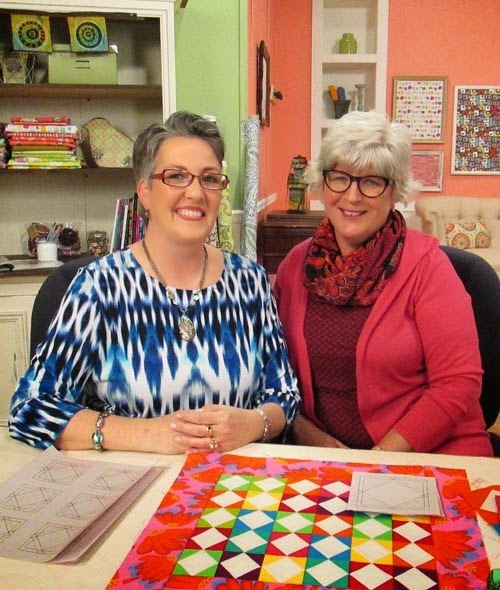 The crew at KS Productions Studio, owned by producer Kathie Stull, is fabulous, and I knew I’d be in good hands with them and the supportive folks at Quilting Arts and Interweave. 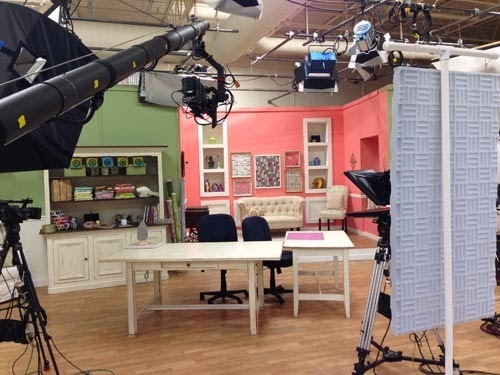 Here is the set, all ready to roll! The producer makes slight changes every few seasons to keep things looking fresh. 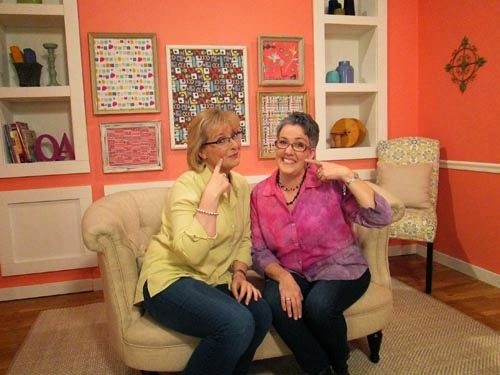 This series, we have fabrics in Carrie Bloomston’s new line “Collage” framed, and a new sofa. 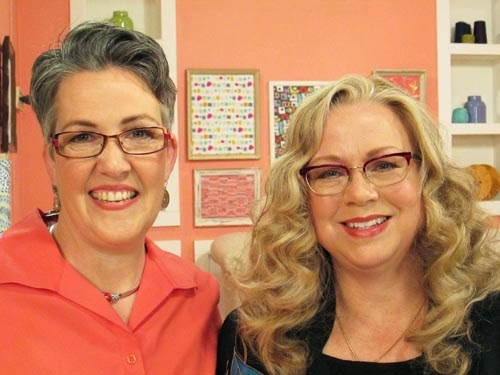 There are at least three or four cameras trained on me and the guests at all times (but no pressure, right?). 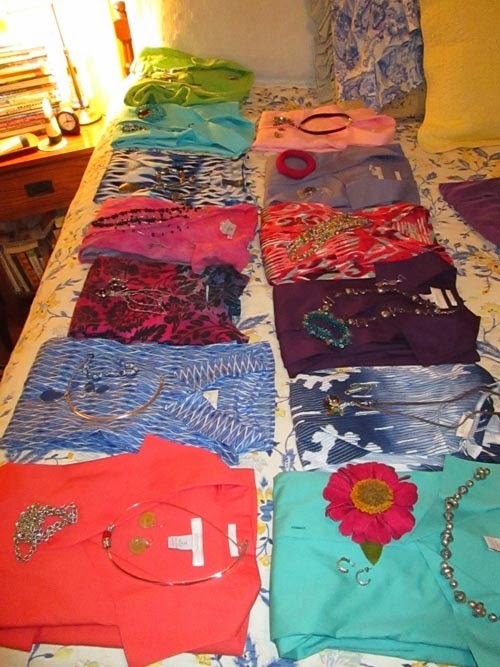 Once on set, the guest arranges her materials and then has a million photos taken before the shoot. 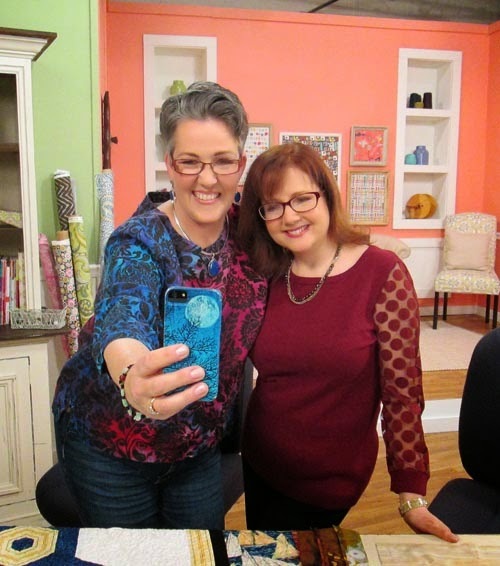 Here I am taking a selfie with Karen Gloeggler. 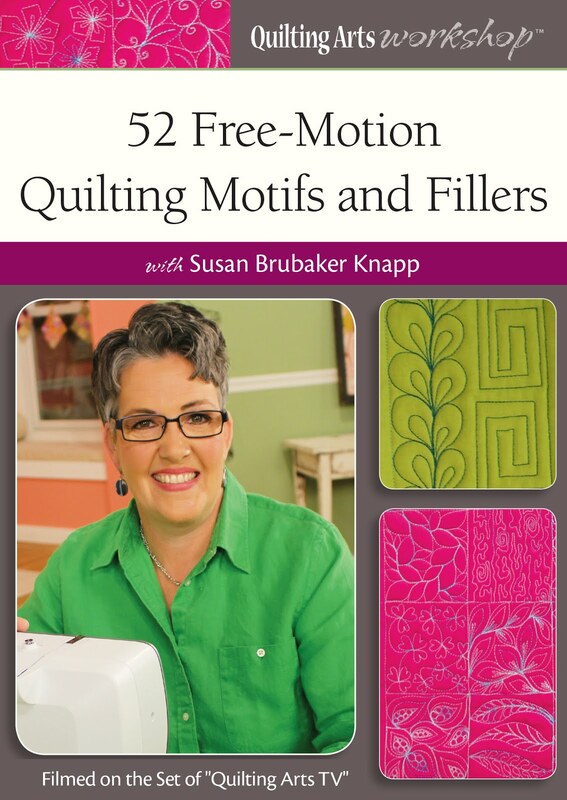 Karen is the author of Jane Austen: Quilts Inspired by Her Novels. During one of the technical delays, we discovered that we went to the same high school, Mt. Lebanon High School, in a suburb of Pittsburgh! How weird is that?!? 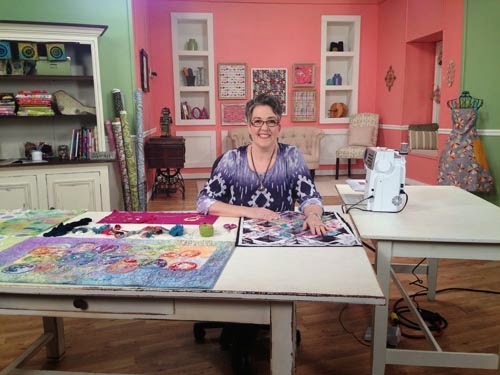 Luana Rubin of eQuilter shot two segments: one on miniature quilts and handbags from the Tokyo Quilt Festival in Japan, and one on SAQA’s new Urban Textures fabric collection. 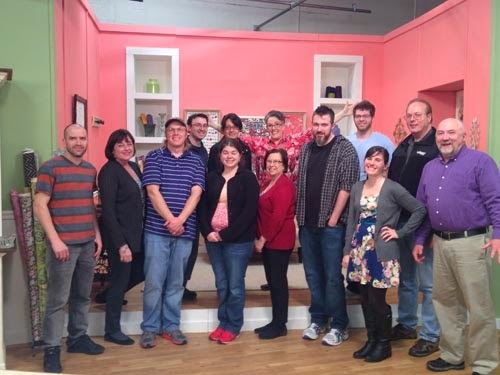 (The second segment will air in Series 1500.) 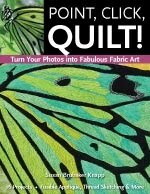 eQuilter sells a wide range of fabric, notions, and books and magazines, and gives 2% of its profits to charity! 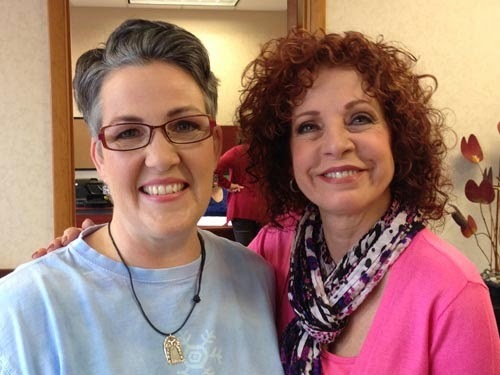 … and later we swapped colors, and were in pink and green again! 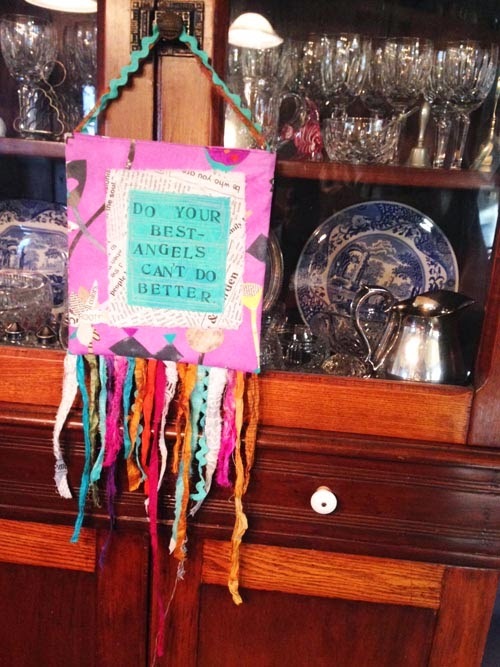 Cheryl Sleboda works for the comic book industry by day, and is a fiber artist by night! She is fascinated by the intersection of textiles and technology. 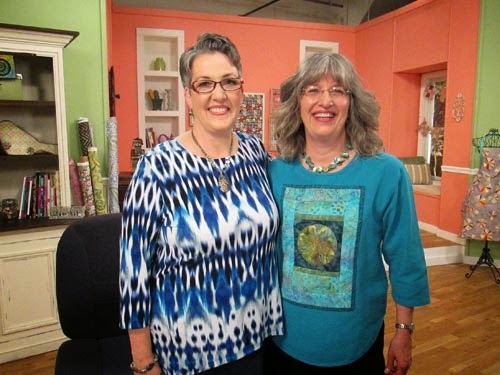 Cheryl shot three segments on marbling and tie-dyeing with Sharpie markers, and then shot a Quilting Arts Workshop in the afternoon; I can’t wait to see it! 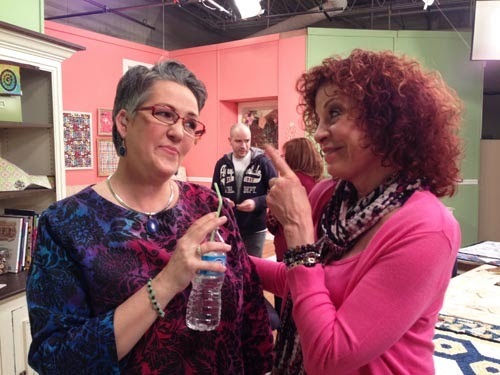 Makeup artist Karen scolds me for drinking out of my water bottle without a straw (it messes up your lipstick). One more thing to learn! (You also can’t blow your nose or itch your forehead without requiring a touch-up.) And don’t even think about touching your hair. 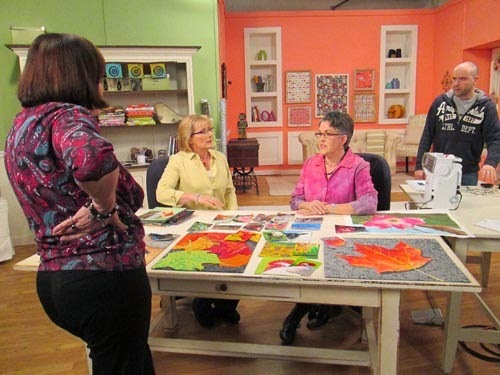 Catherine Redford shot some interesting segments on English Paper Piecing, Paper Foundation Piecing, and quilting with a walking foot. Catherine also demonstrated how to work with some new types of Coats and Clark thread for bold hand stitching and machine paper piecing. Jeanne Cook-Delpit from Bernina did an amazing job helping all the guests get ready to stitch on the Bernina machines on set. 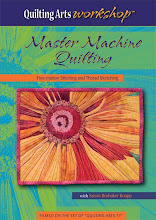 I love and use Bernina machines, so I was right at home working on them. 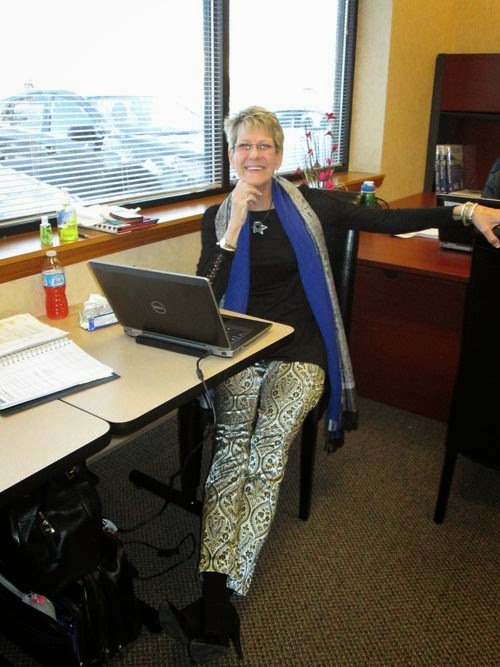 Love those crazy pants, Jeanne! 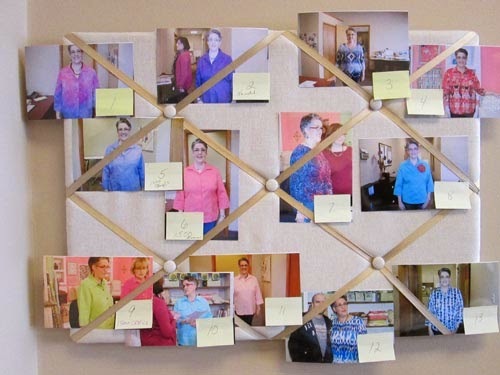 After I changed into each outfit, Katherine Lamancuso, production assistant, took my photo and pinned it up. 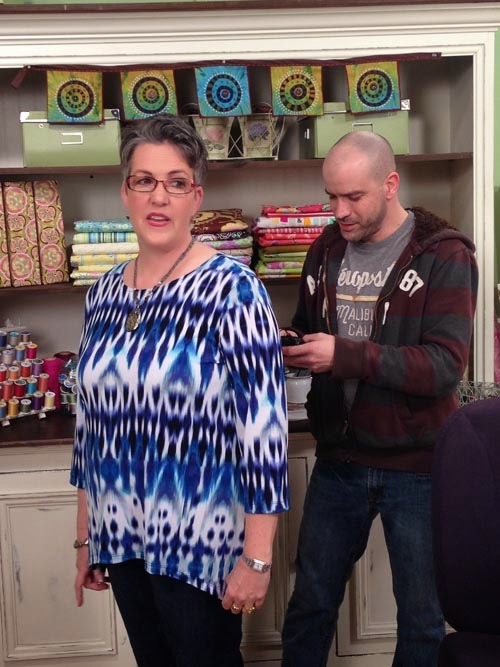 Then we had to keep track of which segment was in which episode, so I could be dressed appropriately. 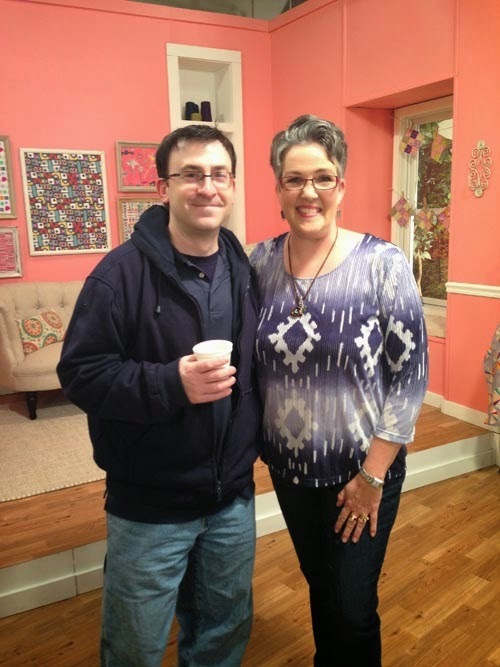 I also had to make sure I wore the same jewelry for each segment in that episode. 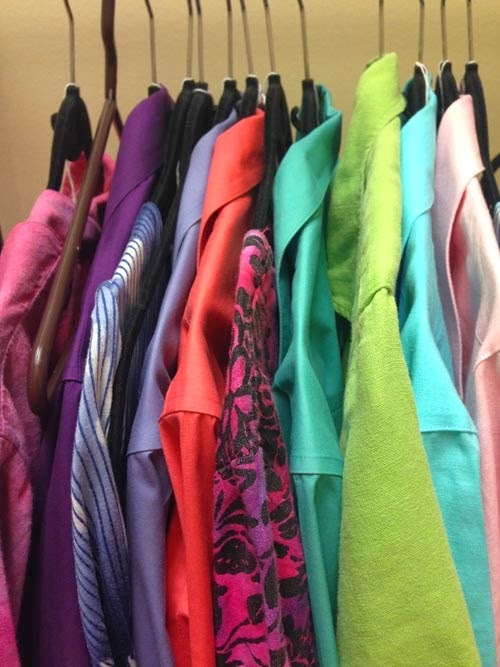 Guests could check my outfits to make sure they didn’t clash! 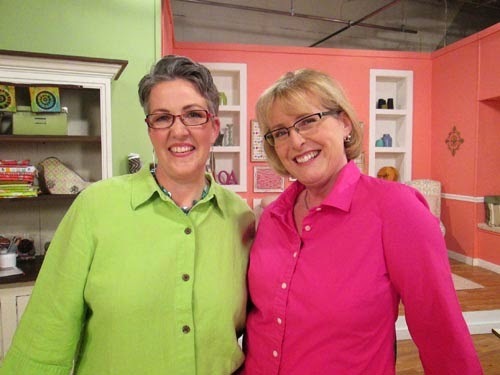 We shot a few segments for Series 1500, and Katherine took notes for me so that I’d know which outfits to bring back for the September taping. 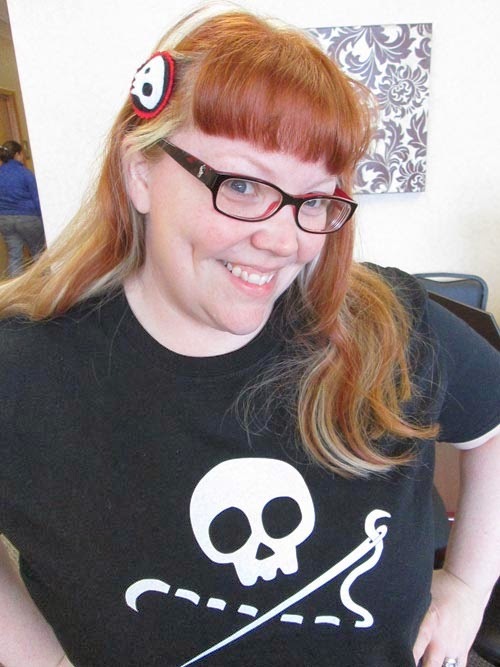 Cheryl Sleboda came in the day after her shoot, and she was sporting her spiffy “Sewing Skull” t-shirt, which she designed. You can purchase one here… I just bought one! 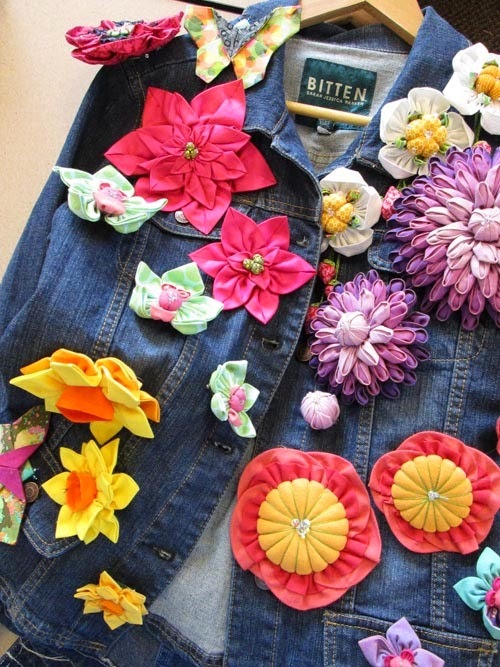 Julie Creus of La Todera brought in this jean jacket covered with her amazing 3-D fabric flowers. 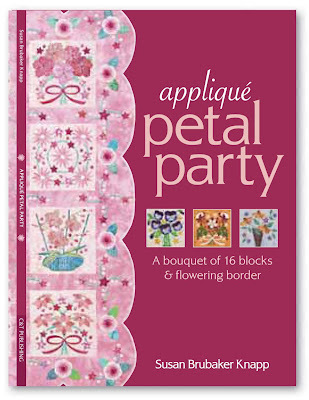 You can get her flower patterns on her website. 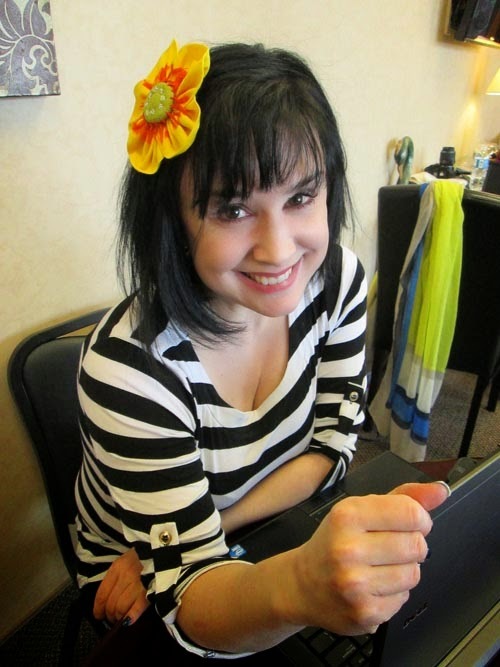 She made a new Buttercup Brooch for her segment on QATV. 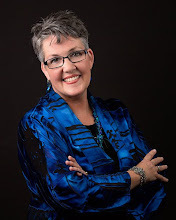 Before each segment, producer Kathie Stull listened to what was going to be covered, then offered suggestions for how it should flow. She helps rearrange step-outs and materials before the shoot starts. 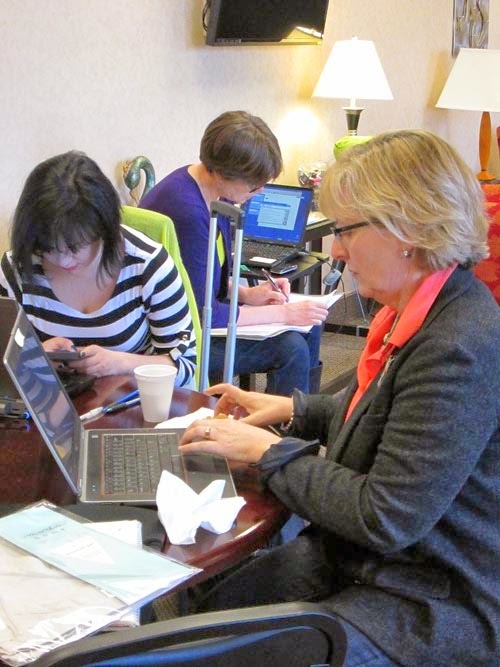 I am always amazed at how quickly she sees potential problems or flaws, and corrects them before we start! 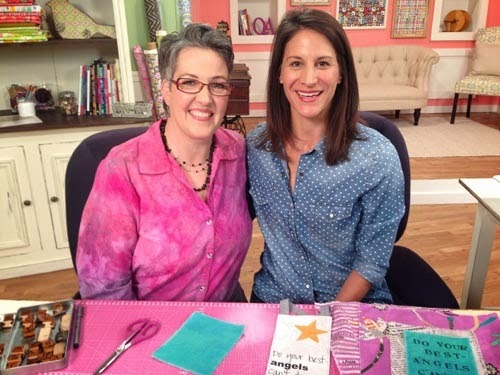 Carrie Bloomston of SUCH Designs shot three segments and a Quilting Arts Workshop. Here’s Brett, the primary guy responsible for making me look good, and helping me stay calm through the craziness. He was working the main camera with the teleprompter, and told me what to do and when. He was awesome! The audio technician, Brian, probably got mighty tired of dealing with my clothes. He had to wire a microphone (clip to the front of my blouse, run a wire down the front of my blouse) and then my “ear” through which I could hear the producer’s comments (clip around my ear and into my ear canal, and run a wire down my back and clip a pack to my jeans waistband). He was so easy to work with, and very patient. 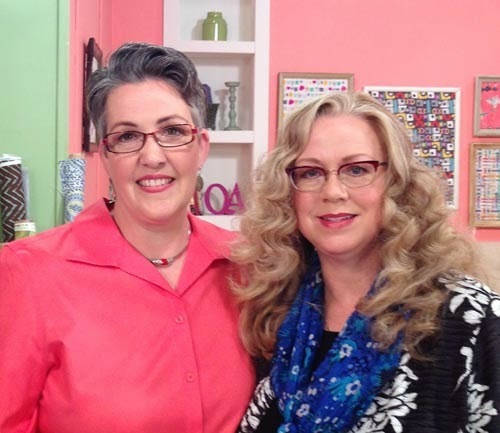 Guest Linda Friedman came from California. 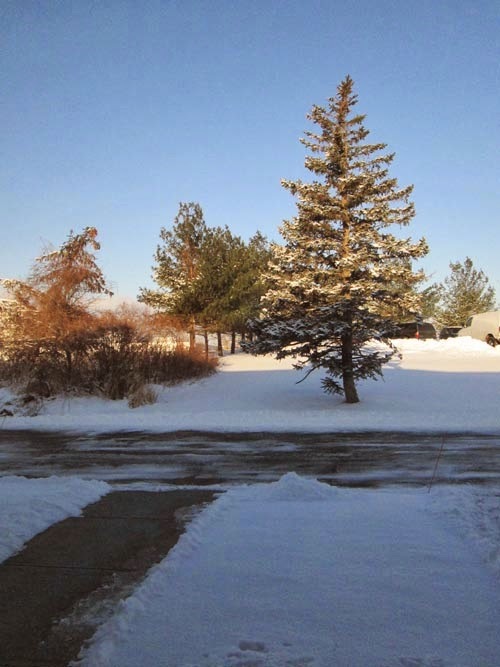 When I talked to her by phone to line her up as a guest, she had voiced some concerns about coming to Cleveland in winter, and I assured her that the chances of snow were very low. Ha! It snowed the day she came in, and it was the first time she had ever experienced snow! 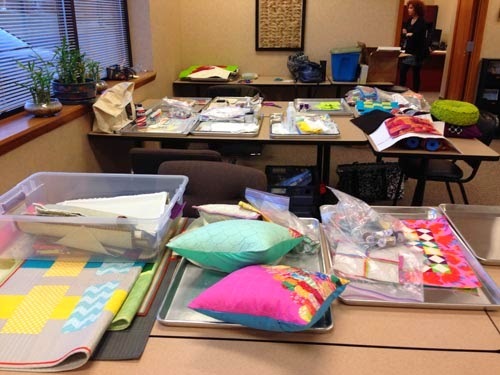 Linda showed us how to use Rit dye to achieve beautiful hand-dyed fabrics by using a pipette and microwave. 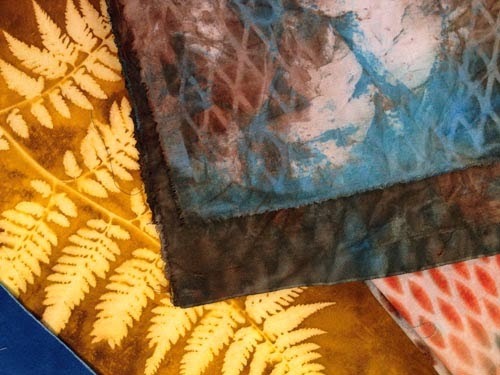 Fiber artist Susie Krage demonstrated some stitched Shibori techniques using wonderful new fabrics called Dye-Lishus® It is undyed cotton fabric pre-treated to accept dyes without using extra chemicals, and it is way cool. It is sold through New World Textiles. 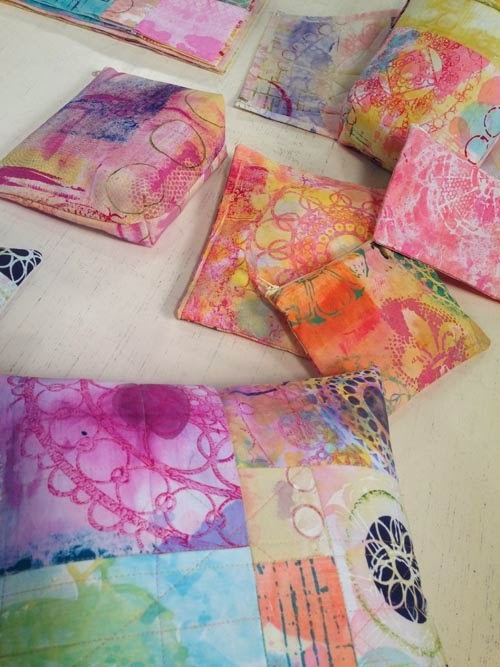 Susie’s work is really beautiful, and after seeing her samples, I want to get out my needle and thread and make some more Shibori fabric! 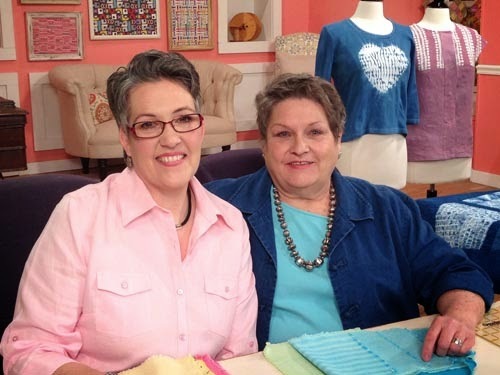 Margie Ullery of Ribbon Candy Quilt Company, did a great job of explaining how to use The Warm Company’s Steam-a-Seam product for one of her designs. 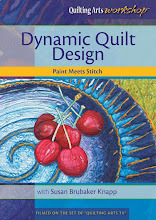 Margie designs patterns for quilted wallhangings and contemporary quilts. 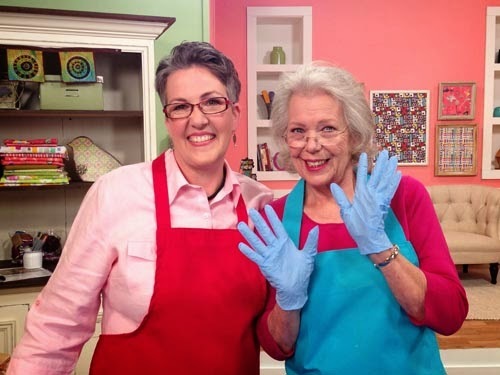 I use and love Steam-a-Seam, too. 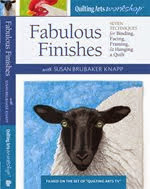 Artist and author Rebekah Meier makes gorgeous mixed media projects. 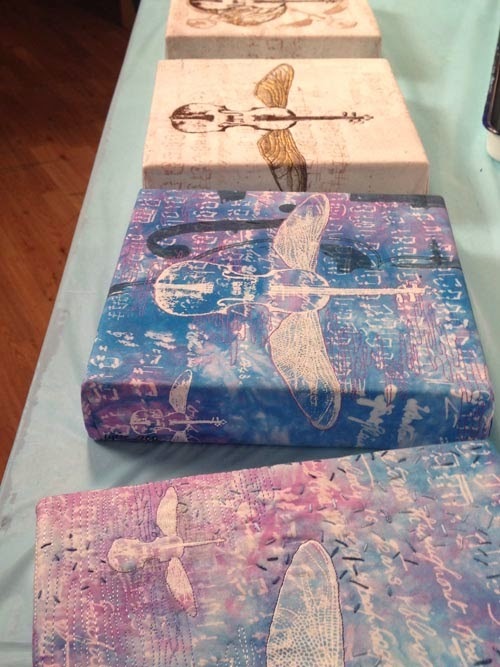 She has a new line of stencils out with The Crafter’s Workshop, and showed us how to do “reverse stenciling” and other techniques to create surface-designed original fabrics, then use them to make a one-of-a-kind pillow. 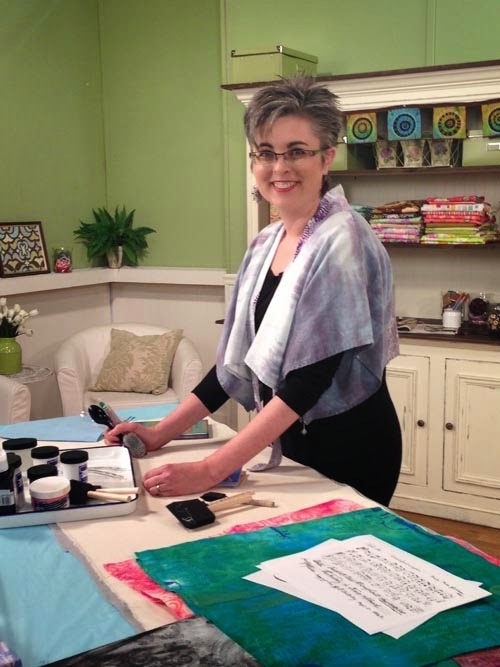 Sue works in cyanotype, heliographs, and collagraphs, and does the most amazing echo quilting. 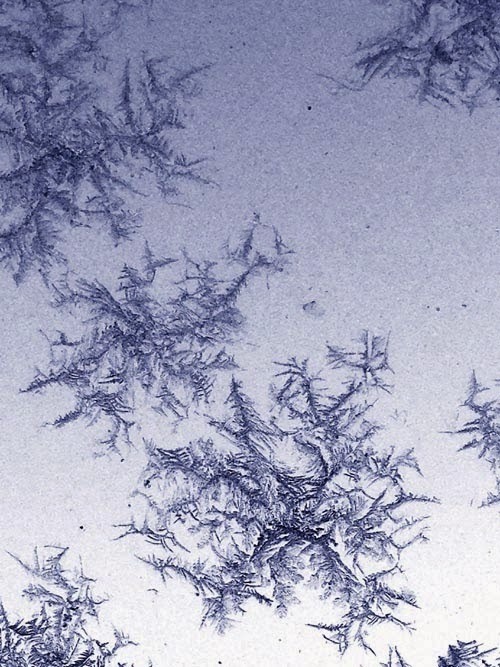 I love her work that features cyanotypes from photos she’s taken of animal skeletons. 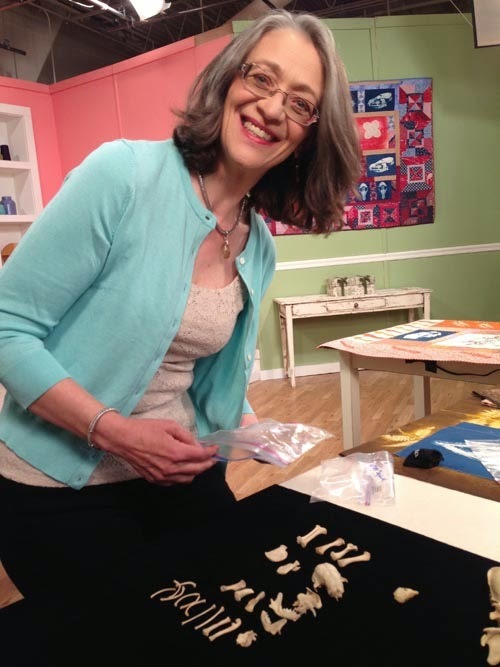 Here she is lining up the bones! 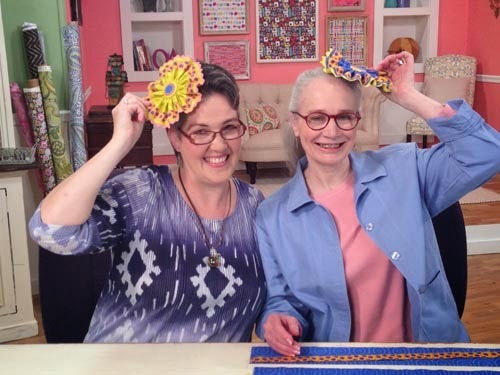 Artist Jane Sassaman shot three segments: She showed us how to abstract from nature, explained how a fabric line is born (she designs for Free Spirit; you can see her Sweet Lady Jane line here), and taught us how to make a lovely ribbon rosette (which we are modeling below). 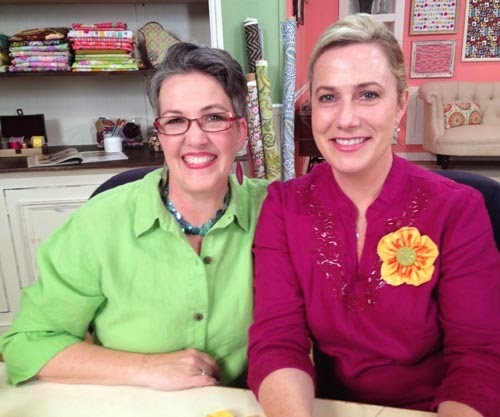 I adore Jane’s art quilts and her fabrics. Her designs, while beautiful and colorful on the surface, always have a little hint of danger, or possibly evil... spiders or plants with thorns or spiky leaves. 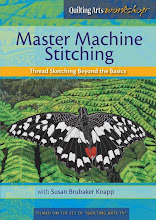 Jane’s detailed large-scale prints are so pretty you don’t want to cut them up, leading her to write a book (Patchwork Sassaman Style, Dragon Threads) on the subject. But, boy, was it fun! 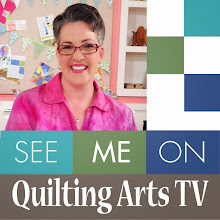 I get a front row seat to watch some of the world’s best fiber artists and surface designers and quilters do their thing, and teach me new techniques. We shoot one week in March and one week in September. 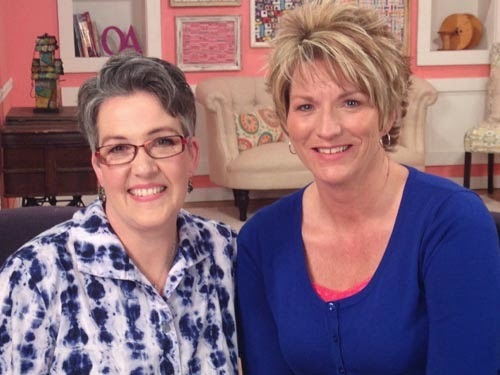 The 13 episodes we shot this past week will air starting in July on many public TV stations in the United States. You can view previews of previous seasons here. You can buy DVDs of entire Series here. Want to find out if you can watch in your area? Go to this QATV webpage, and enter your zipcode to find out. Think you’d make a good guest? 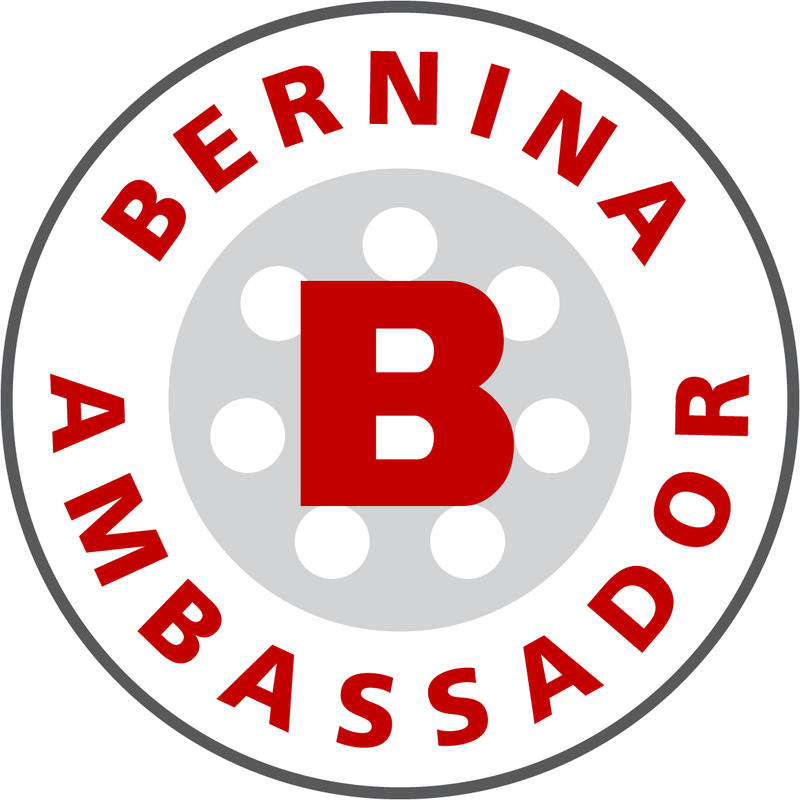 We are looking for lively, professional guests who demonstrate excellence in their art. 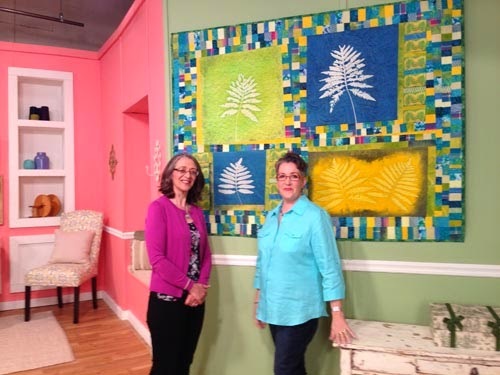 We choose a mix of guests that will appeal to our viewers, who include art quilters/fiber artists, surface designers, and contemporary and modern quilters. 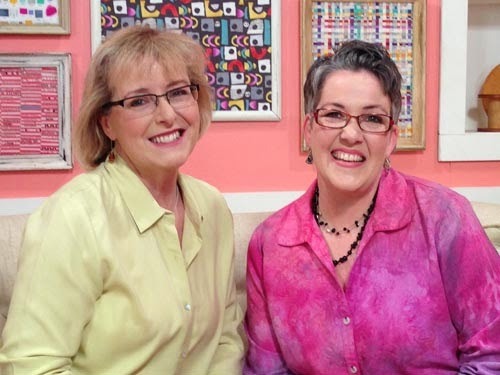 Some segments are technique oriented, and some are project oriented (guests provide directions for the projects for free, and they are available to our viewers through the Quilting Arts TV website). 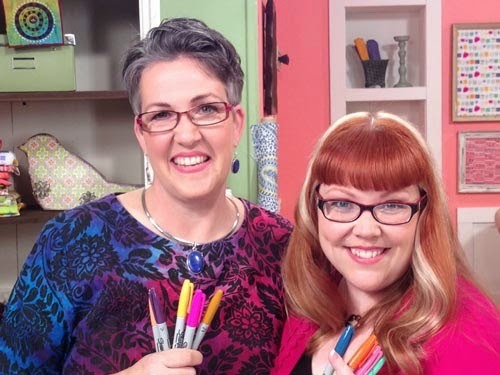 Our show is aired on Public Television stations in the United States, and under their policies, guests are not able to promote their services or products (for example, books or patterns or quilting businesses), unless they are using products from one of our show sponsors. 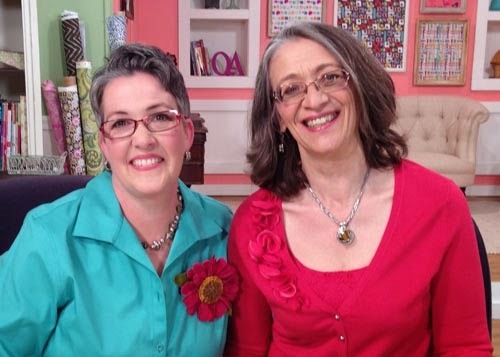 As someone who has appeared on four seasons of Quilting Arts TV before becoming the host, I can tell you that the exposure I got was well worth the expense, but this is something you should take into account. We advise you to become familiar with the show, and its content, before submitting a proposal. If you think you would be a good match for the show, please write me and include two or three ideas for segments (either techniques, or projects, or both). For each, write a short paragraph or two of description. 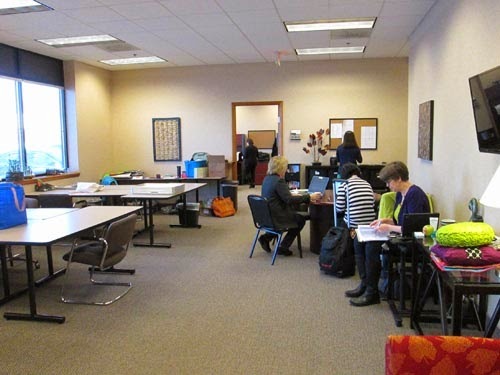 Include photos or links to blog posts/websites where we can see the project or the technique.